Let us take a break from the subject ! A head full of money ! 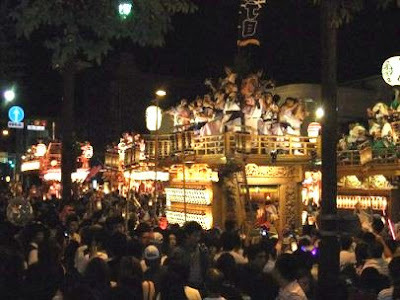 Held for two days on the 3rd Saturday and Sunday of October, the Kawagoe Festival is Koedo-Kawagoe ’s liveliest event of the year. Famed for its Kurazukuri (traditional architecture) zone, this city is one of the Kanto Region’s foremost sightseeing spots, and it attracts large numbers of visitors each year. 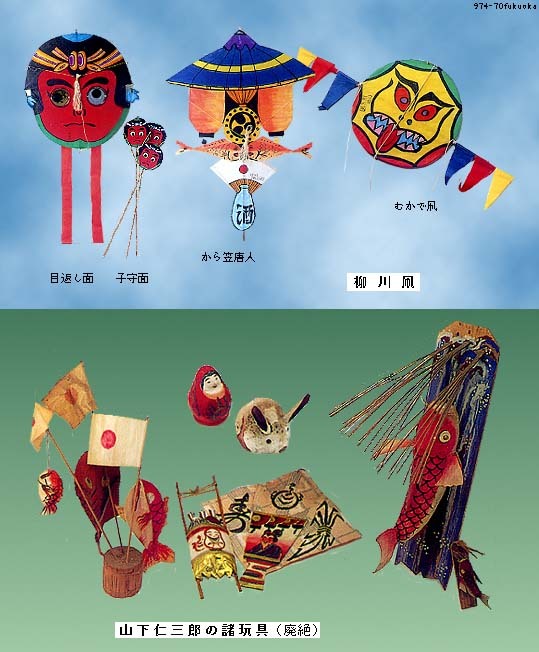 As they face each other, the several festival floats compete with each other in a hayashi performance (a traditional Japanese orchestra comprised of flutes, drums, handbells and dancing), cheered on by the excited voices of festival-goers holding aloft paper lanterns. The excitement reaches its climax with the evening ‘Hikkawase’. The Kawagoe Festival has developed both by maintaining a history of over 360 years as an invaluable town festival that preserves the style and elegance of the Edo "Tenka Matsuri", as well as by adding its own unique Kawagoe features.
. enmusubi 縁結 finding a good partner . 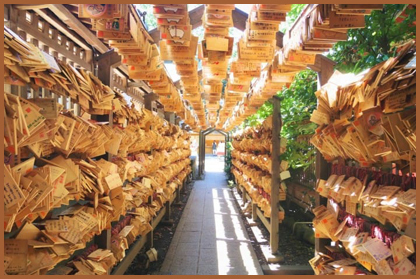 In a tunnel are all the ema 絵馬 votive tablets.
. 柿本人麻呂神社 Kakinomoto Hitomaro Jinja . 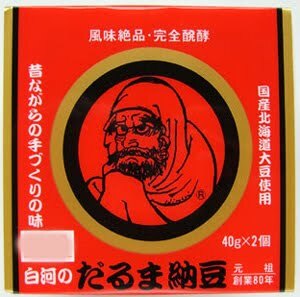 He is also celebrated as protector of fires 防火の神. These dolls have a history of more than 160 years. 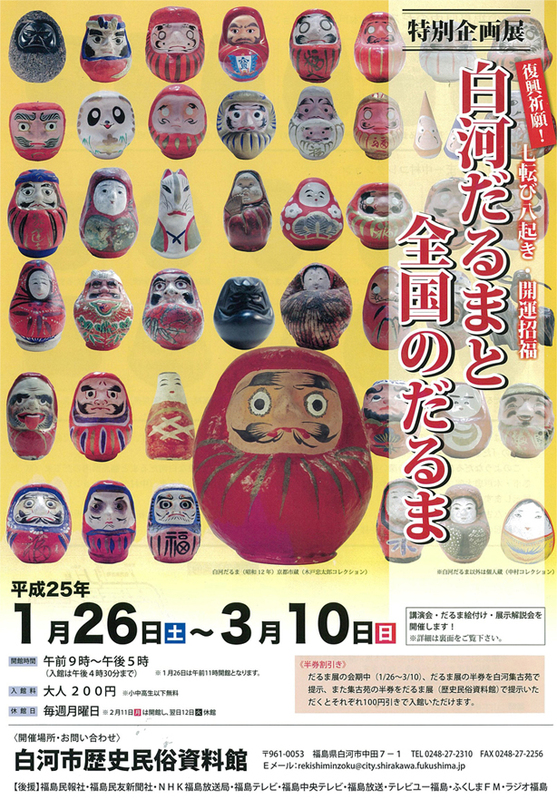 They are sold at the annual Daruma Market on February 11. 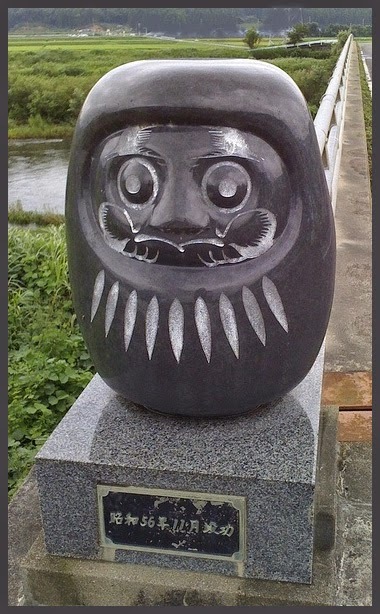 Daruma made north of Shirakawa all have the black eyes painted. White ones are for bringing good luck, red oned are for avoiding evil influences. They have a tradition of more than 160 years. You can paint the eyes for good luck. They come in different sizes and red or white. 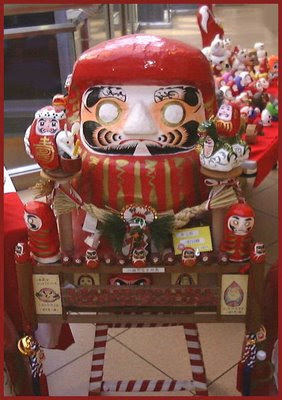 The Daruma in the picture next to it is from Iwaki. 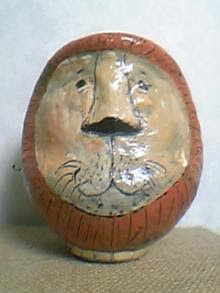 It is said his painting of Daruma became the model for the dolls of Shirakawa. the beard in the form of the turtoise. With a wonderful catalogue of all the exhibits ! 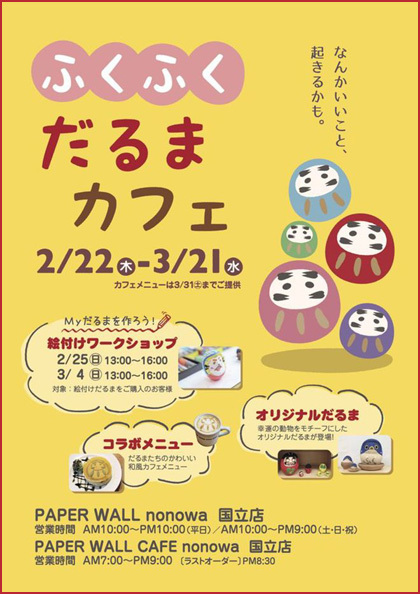 Shirakawa town has been a market place since the Kamakura period and the present-day Daruma market developed from an old "Flower Market" in January; it is now held on February 11th, on the National Holiday for the Founding of the Constitution. 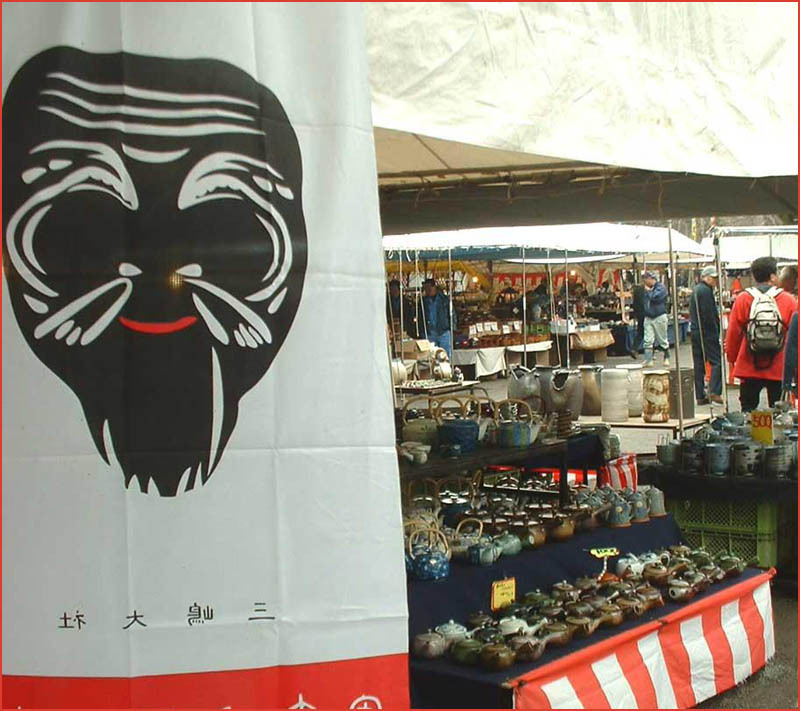 There are more than 800 stalls, about 150.000 Daruma dolls are produced locally and about 150.000 people visit the market. 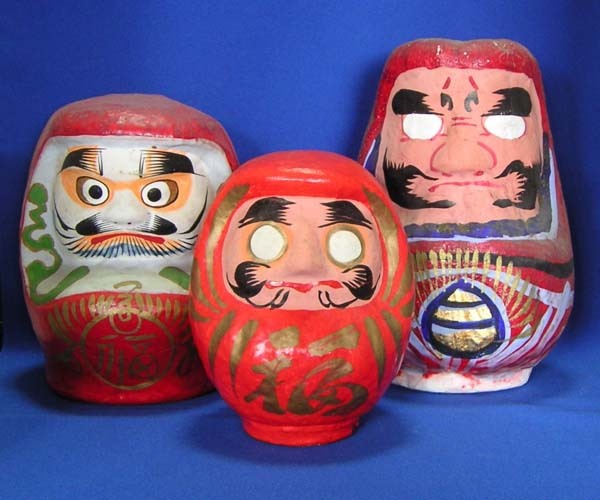 Daruma dolls come in 18 different sizes, mostly with all the auspicious symbols we have just seen above at Jindai-ji. The biggest is 75 cm and the smallest 8 cm. 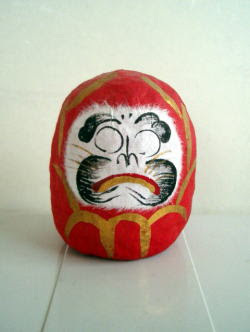 they sell ema votive tablets with the red and white Daruma. 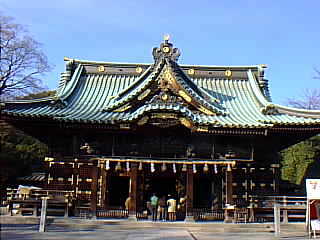 The shrine was founded around 775. The deity was a protector of the Samurai from Hitachi. 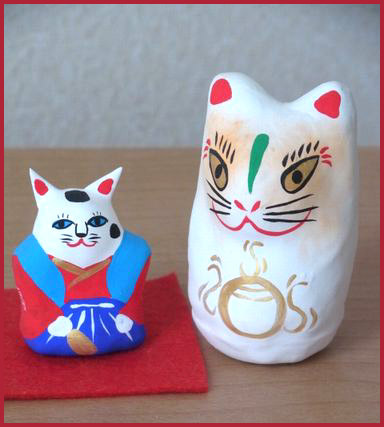 You can also make your own Daruma ther, Mr. Watanabe will help! The tradition goes back to Lord Matsudaira Sadanobu 松平定信 and the first doll maker, Watanabe Hanjiro 渡辺半次郎. is famous for the roofs of the old farmhouses, strong to bear a lot of snow. This sight is a World Heritage. The houses in the villages in the valley are unique to Japan. They are very big, and have thick thatched roofs that come down steeply. This way the snow can slide off the roofs. There is also enough space under the roofs to store supplies for long winters. The inhabitants of these villages used to earn their money in the silk-industry. They lived a very secluded life. In Japanese, the houses are called Gassho-zukuri. Gassho means praying hands, suggesting the form of hands raised in prayer to the buddha. Here it refers to the triangular shape of the roof. Once the center of the silk trade in Japan, these houses are now kept as examples of the gassho-zukuri (prayer-shape) style of architecture used in some mountainous parts of rural Japan. Extended families lived on the first two floors, while the upper story sheltered the silkworms brought over from China. (Silk traveled east from China, too, along the Silk Road.) Cooking and heating fires permeating the upper story kept it at an ideal temperature for sericulture even in the coldest winters. The smoke protected the cocoons while discouraging wood-boring insects. 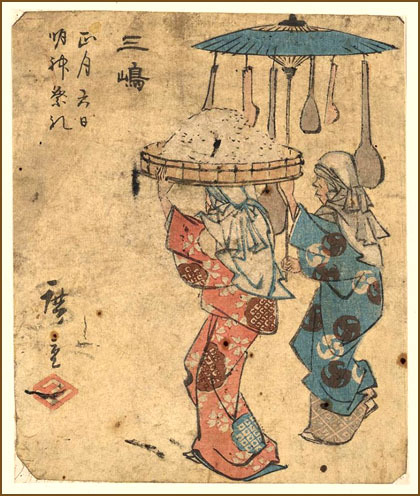 The silk was sold to expert kimono-weavers in Kyoto and Edo (the old name for Tokyo), and became a key item of Japan's exports. So important was the silk trade to Japan that Dupont's invention of Nylon in the 1940s was deemed to have strategic value by the US Government. Nylon stockings foreshadowed the end of the silk trade as an international business. Every ten years or so, the thatch roof of a gassho-zukuri house must be replaced, and this work requires the help of neighbors. Even as the economic mainstay of Shirakawa has shifted from silk to tourism, the community work system remains intact today. Shirakawa is actually only one of several villages, and others such as Gokayama and Ainokura have their own uniquely recognizeable styles of construction. Located in valleys where the wind direction is predictible, the houses are generally oriented with their narrow sides facing the wind, giving the villages the look of a schoolroom of alert students when viewed from above. Summer brings a plague of bus tours; winter is much less crowded and is the best time to wander around freely. Several of the gassho-zukuri houses serve as country inns, minshuku where one can stay overnight at reasonable cost. These offer a great chance to experience both the cold of winter and the warmth of an old country inn.
. 「きらり！えん旅」 NHK Kirari Entabi . Support for Shirakawa after the great earthquake. Part of the castle walls were destroyed and many people from Fukushima radiation evacuees now live in temporary housings in the town. is also a world heritage site close to Shirakawa. In winter folks had no way of getting over the steep snowed passes and could not do much. He is almost square and has a rather unhappy expression !
. Daruma Dolls from Fukushima 福島だるま . 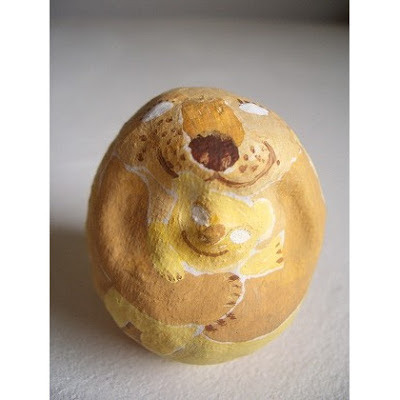 Daruma News 2005, Nr. 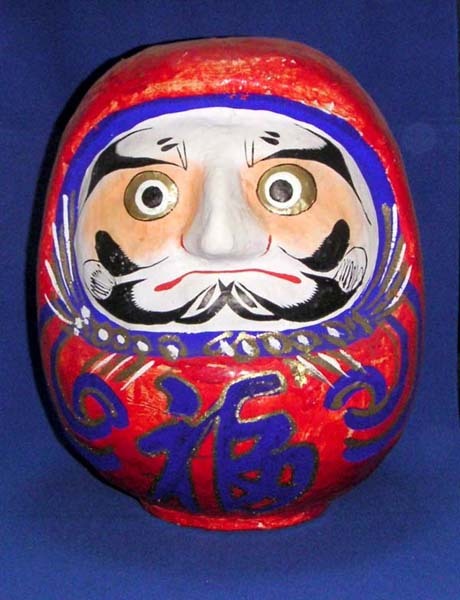 7 had an interesting contribution about the female Daruma. 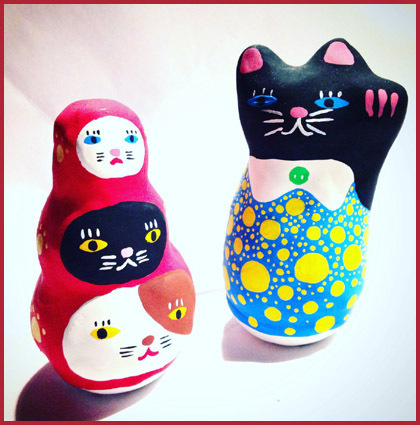 Murakami san listed 30 dolls from his collection. ottoki in Korean means okiagari, go fall down and get up again. The dolls come in male and female form. Little dolls are sold at the entrance to the many pagodas of Burma.
. Kanazawa hariko 金沢張子 papermachee dolls . 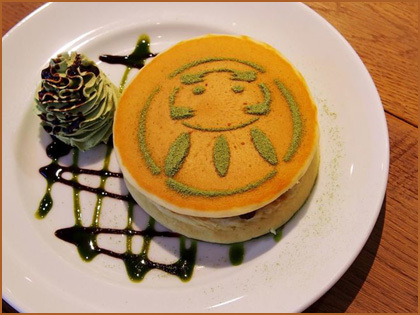 (there are different Hachiman Okiagari from Shikoku). 18 from Ashiya 芦屋の女達磨, Fukuoka pref.
. 23 from Tosa　土佐の女達磨 . is a different matter. 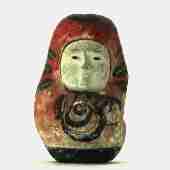 I will take it up in more detail.
. Komatsu Nyoin Daruma 小松女院だるま . was born in the year Tenpo 3 in Koshigoe and studied western medicine. He supported the idea to promote tea drinking in Japan for the health of the people. In 1884, Kenzo Takahashi invented a steaming machine and heating machine as well as a friction machine. 15 years later he invented a rubbing machine and brought quasi machine production to Japanese green tea industry. In the form of the God of Good Luck, Ebisu. Ebisu is the main deity venerated at Mishima Shrine. 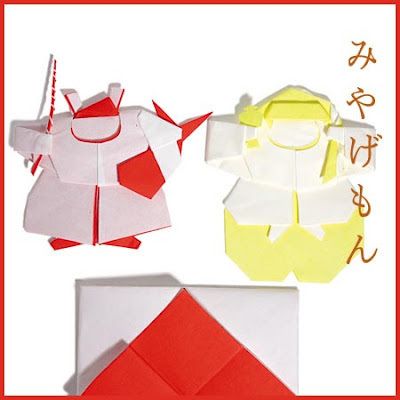 This kind of papermachee doll is not produced any more.
. Ebisu えびす　恵比寿　. It is not clear exactly when and by whom the Shrine was founded , though it seems to have already existed in the Nara Period (710-794). Records indicate that the 55th Emperor Montoku (827-856) conferred an official rank on the Shrine in 850 and the 56th Emperor Seiwa (850-880) upgraded the rank in 859. At one point, it held the No. 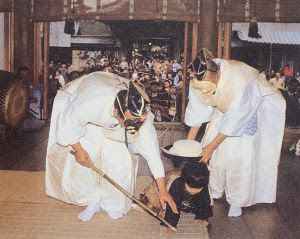 1 position of the shrine list in the Izu Peninsula and it still retains the status as the most authoritative in the area. In the Edo Period (1603-1868), Mishima became an important post-town of the 503-kilometer-long Tokaido Highroad connecting Tokyo to Kyoto. Travellers who were to go over or came down from the 15-kilometer-long steep Hakone mountains usually stayed in Mishima, and the Mishima post-town prospered with a horde of tour groups. Under the Tokugawa Shogunate rule, Daimyo, or feudal lord, of each prefecture had to live one year in Tokyo and the next in his home prefecture leaving his family in Tokyo as hostage. Really, Mishima was one of the most popular post-towns of old-time 53 stages on the Highroad. 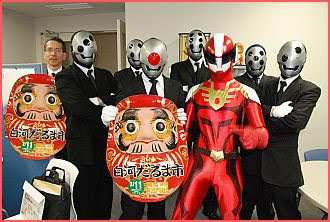 The deities are Ebisu and Daikoku. The fishing pole of Ebisu is made from twisted paper. 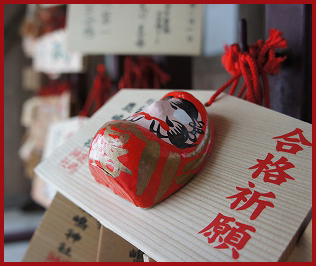 Ebisu is venerated here as the God of Good Luck, and his pal, Daikoku, is added for more good luck in Mishima.
. Kotoshironushi no kami　事代主命 . The term yamatsumi means a spirit dwelling within a mountain, with the result that the name Ōyamatsumi means a great deity with jurisdiction over mountains. Shrines to kami with this name can be found throughout Japan. In Japanese folk religion, the kami of any given mountain is sometimes called Ōyamatsumi, as is the spirit of someone who has died within the mountains; in many cases, cairns of stones are erected as a place of worship.
. Oyamatsumi no Kami 大山祗大神 .
. Oyamatsumi no Mikoto - Okayama .
. 大山祇神 （おおやまづみのかみ Ooyamazumi no Kami. .
venerated at Mount Kokushidake 国師岳 in Oku-Chichibu.
. Yama no Kami 山の神, Yamanokami, God of the Mountain . They are 4.5 cm thick, the extra large ones are 6 cm thick. 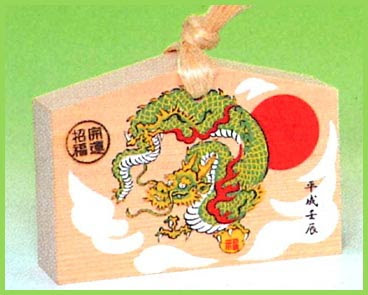 The motive is usually the zodiac animal of the year, and a burned stamp 焼き印 of the shrine. 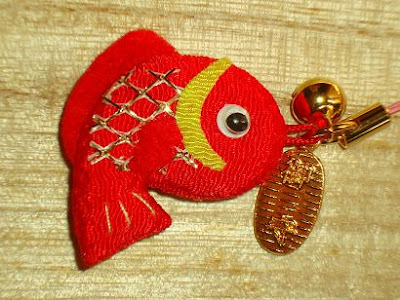 The cord is made from hemp, all by hand by the shrine maidens of Mishima.
. Amulets with Fish . Most styles of Japanese pottery are named after the city or area where they are made, while others bear a family name, such as Raku. However, one style of pottery is named after a place that has nothing do to with its production -- the Mishima style (slip-inlay style). As far back as 1636, there was a certain calendar published at the Grand Shrine of Mishima (Mishima Taisha) written in little squiggly kana lines. Because the "rope curtain" designs of 15th-16th century Korean Punch'ong stoneware resembled the lines of the calendar, works of this pattern came to be known as Mishima. The Mishima name may be 17th century, but the style itself goes back to Korea's Koryo Period (935-1392) when bowls decorated in this way were known as Korai-jawan or Korai tea bowls. 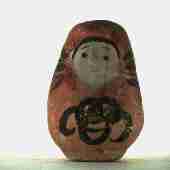 These were inlaid with various motifs such as floral and animal depictions. A potter would incise the design in the body, fill it in with contrasting colored clay or slip and then cover it with a transparent glaze. This technique peaked in Korea in the 12th-13th-century Koryo celadons, deemed "first under heaven." It's also referred to as zogan. Another inlay style is called reverse inlay. This is where the potter cuts away the background, leaving the design in relief, then the background is brushed over with a slip and the excess is scraped away. Carnival Fun, But Buyer Beware ! to bring you good luck ! 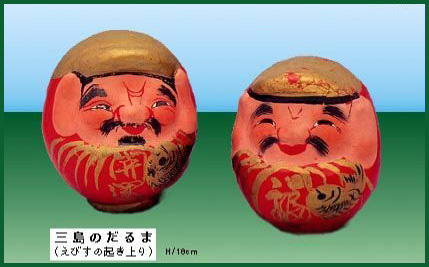 O-tauchi 御田打（おたうち）"honorable hitting the fields"
On the seventh day of the first lunar month. Prayer rituals for a bountiful harvest in the new year. People used to dress up and imitate the movements making when preparing the fields for planting. They also walked around through town in merriment.
. WKD : New Year Ceremonies .
. preparing the fields, "hitting the fields" tauchi　田打ち . on August 16, the main events take place. Handheld fireworks are offered to the deities. 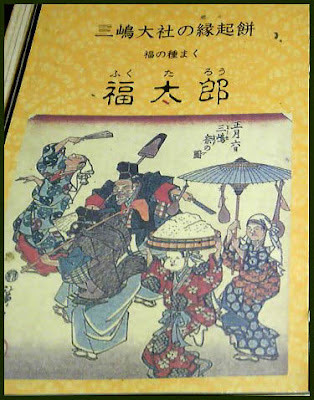 On Augusta 17, there is Yabusame 流鏑馬 archery on horseback.
. The 53 stations of the Tokaido .